The Cuisinart Cookware Set is a perfect choice for serious cooks, entertainers or big families, this ultimate set includes everything a home chef needs. Cuisinart offers three saucepans, three skillets, a large saute, the versatile 9-quart stockpot with pasta insert, and a steamer insert that fits the 2-quart and 3-quart saucepans. 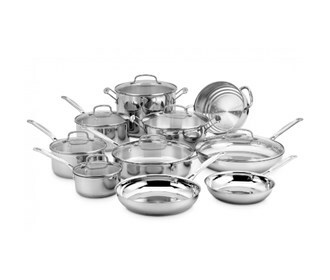 The Cuisinart 17-Piece Cookware Set has many exciting features for users of all types. 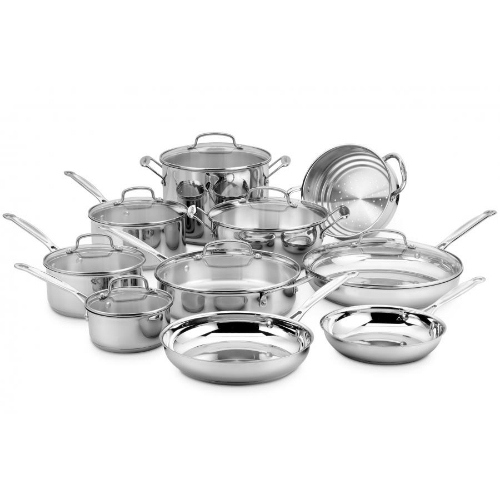 You can extend the lifetime of your Cuisinart 17-Piece Cookware Set with the purchase of a FactoryOutletStore Factory Protection Plan. The Cuisinart 17-Piece Cookware Set is sold as a Brand New Unopened Item.